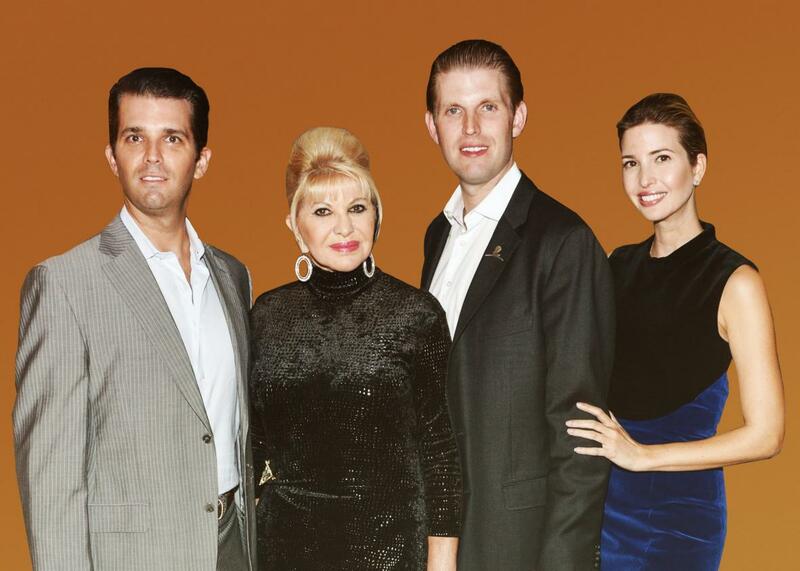 Ivana Trump’s parenting memoir Raising Trump, reviewed. Ivana Trump, with children Donald Jr., Eric, and Ivanka, attends an event at Trump National Golf Club Westchester on Sept. 21, 2015, in Briarcliff Manor, New York. Photo illustration by Slate. Photo by Grant Lamos IV/Getty Images. There was really no reason to expect that Raising Trump itself would be anything more than “self-serving noise,” too. “I believe the credit for raising such great kids belongs to me,” Ivana writes in the introduction. “When each one finished college, I said to my ex-husband, ‘Here is the finished product. Now it’s your turn.’ ” The book’s foundational premise, that the three eldest Trump children are all admirable people, is plainly absurd. Would you read a warm-and-fuzzy parenting memoir by Fredo Corleone’s mother, or Marie Antoinette’s? (Actually: probably.) The most surprising thing about Raising Trump, as it turns out, is not any one particular bit of gossip. It’s the fact that it’s a pretty good book. Famously, she did. The blond beauty made her way to Prague, then Canada, and finally to New York City, where she met Donald J. Trump on her first night in town on a modeling trip. He proposed on a ski vacation, telling her, “If you don’t marry me, you’ll ruin your life.” She was barely involved in the planning for her extravagant Manhattan wedding and knew just six of the 600 people who attended. Their honeymoon lasted just two days, because her new husband had to rush back to New York to finalize a real estate deal. It doesn’t take much squinting to recognize that the Trump kids’ childhood was awful. Ivana insists that she was a strict parent, but she also relates that Donald once called Ivanka’s teacher to request that an exam be rescheduled so the teenager could attend a birthday party in Las Vegas. (She does not mention the fact that Ivanka was “politely asked” to leave her first private high school, as the Financial Times reported last month.) The children seem like lonely pawns of their parents’ egos. Soon after their split, Donald sent a bodyguard to the family’s apartment to fetch 12-year-old Don Jr. and bring him to Trump’s office. He then called his ex and said, “Ivana, I’m keeping Don. You’re not getting him back.” At this point, Don Jr. was not even speaking to his father. “Okay, keep him,” Ivana replied. “I have two other kids to raise.” Ten minutes later, the bodyguard returned the boy to his mother. Trump, naturally, was only bluffing. Reflecting on this cruelty decades later, an untroubled Ivana writes that his defeat made her feel strong. Long-divorced, Ivana has retained the Trump name and, it seems, the family’s particular values: the importance of appearances, money, and public victories. When Ivana cradled their first child in the hospital and suggested they name him Donald Trump Jr., her husband recoiled in horror: “What if he’s a loser?” When Ivana and Donald attended the U.S. Open together, they would root for whoever was winning. What kind of person roots against the underdog and calls a newborn baby a loser? The book steers so clear of politics that it’s almost possible to block out the present horror for a few hours and enjoy the preening, delusional Trump clan as an imaginary family of entertaining 1980s cartoon villains. Raising Trump is an effective reminder that once upon a time, when nothing was at stake, the Trumps’ collective atrociousness was merely fun. Raising Trump by Ivana Trump. Gallery Books.